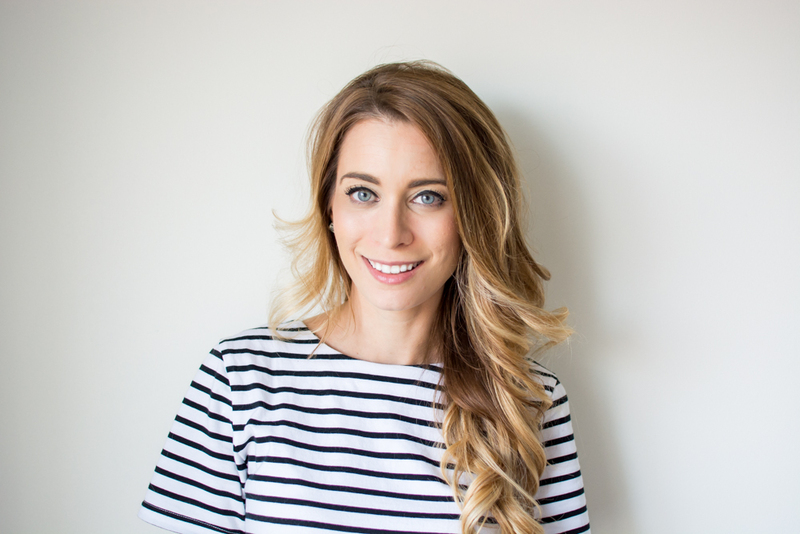 August 2015 | La Petite Noob | A Toronto-Based Fashion and Lifestyle Blog. Those of you who have been following me for some time have seen my transition from notorious over packer to carry on only convert (see previous posts here and here.) Using carry on luggage only for travel is a great way to save time and money. 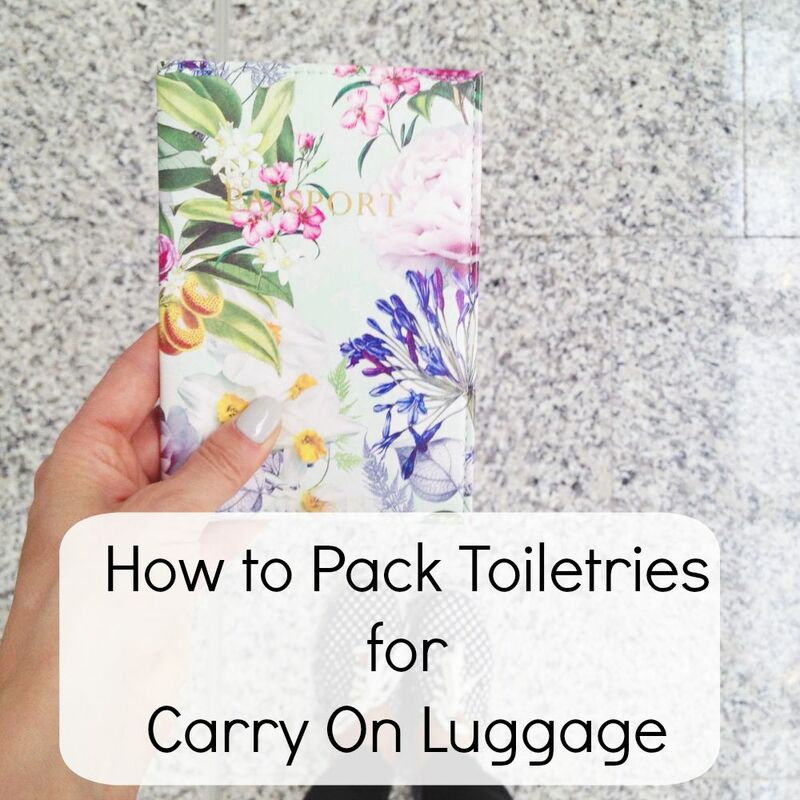 One question that I've been asked numerous times is how to properly pack your toiletries for carry on travel. Liquid restrictions make stuffing all of your necessary potions and products into 100 ml/grams containers and then into a 1 litre clear bag pretty tricky - but totally manageable. Here is my tried and true method to packing all of my necessary toiletries into my carry-on luggage, and 3 tips on what to bring and what to leave behind. It's that time of the year again where this gal packs her [carry on] suit case, jumps on a plane and heads on vacation for a few weeks (see the details of last year's trip to Italy here). This year we're headed to California, flying into San Francisco and making the road trip along the coast down to Los Angeles with plenty of stops along the way. I've never been to the West Coast and I'm looking forward to seeing the difference in lifestyle and culture. Expect a few posts from me when I'm gone - of course I'll let you know how I'm packing for a two week road trip in just a carry on suitcase, how to pack toiletries for carry on travel and more! If you guys have ever done a similar trip, or are from the area I would love to hear your recommendations. Where to eat, what to see - I want to hear it all! 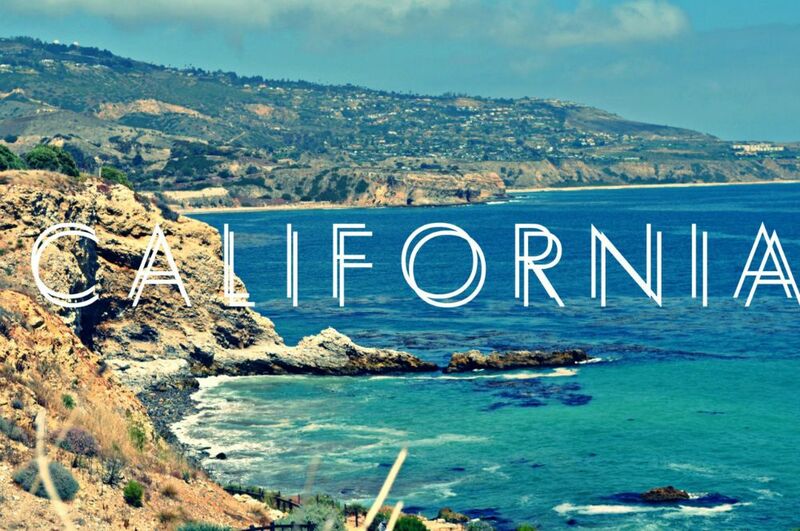 In the meantime, if you need me I'll be California dreaming! 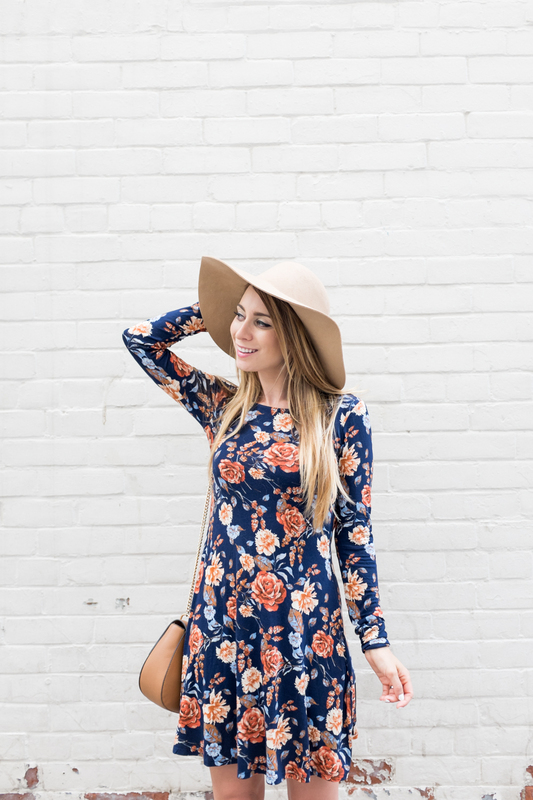 And we're back to transitional outfits on the blog! Yes, as fast as you could say "hello sun"the temperatures took a dip in Toronto and we're back into pre-fall weather. I'm having a hard time coming to terms with the fact that I will soon have to say farewell to all of my cute little summer dresses for the season, so I decided to take this mint number out for one last spin. This mint floral dress may be my most summer-specific piece in my wardrobe, but I'm pleasantly surprised by how wearable it is in the cooler weather with a denim jacket and a pair of booties. The moral of this little story is that you really do just need a cropped jacket and a pair of booties to take any summer dress into fall. Although I've been trying to incorporate some Fall pieces into my regular clothing rotation, on Sunday I felt inclined to give Summer another hurrah and dress in billowy and flowy pastels. You guys know how much I love my maxi skirts, and this blush pink one has made many an appearance on the blog (see here, here and here.) Normally I'm one to advocate pairing a flowing maxi skirt with a tighter shirt on top for some balance - especially as a petite girl - but lately I've been really feeling a loose blouse with a wider bottom. The silhouette is not stereotypically flattering, but I think adds a bit of interest and can really change up your look. The fact that is feels like you're walking around in the most luxurious pyjamas doesn't hurt either. Although Toronto is currently in the middle of a massive heat wave, my head has been totally focused on Fall fashion. I've put a total halt on buying any last summer pieces and am slowly adding different fall-themed items to my closet. The problem is, if you're anything like me then if you acquire a shiny new thing to add to your collection you want to wear it now - who can wait until fall? Transitional pieces like this burnt orange shift dress are perfect to get you from summer to autumn. I still felt cool in the heat by wearing the copper dress with bare legs and a pair of flats, but can totally see it paired with some opaque tights and booties once the weather gets chilly. Three cheers for getting the most out of your fall clothing and using selective pieces to help transition out of summer. You guys probably thought that I had given up on my whole 30 before 30 list now that I've turned the big three-oh. Well, I'm back on the wagon and am super pumped to complete the remainder of my list while I'm still in my early thirties. If there's one thing that I'm a sucker for, it's a flower market. Give me copious amounts of fresh flowers artfully displayed in buckets, mason jars and tins, and this girl is in her happy place. With the Toronto Flower Market making it's monthly appearance on the weekend, I knew that waking up early on a Saturday was inevitable in order to get the good stuff (I was after jumbo dahlias and those babies go fast.) Imagine my dismay when Saturday morning rolled around and I was met with grey skies, rain and the cold. 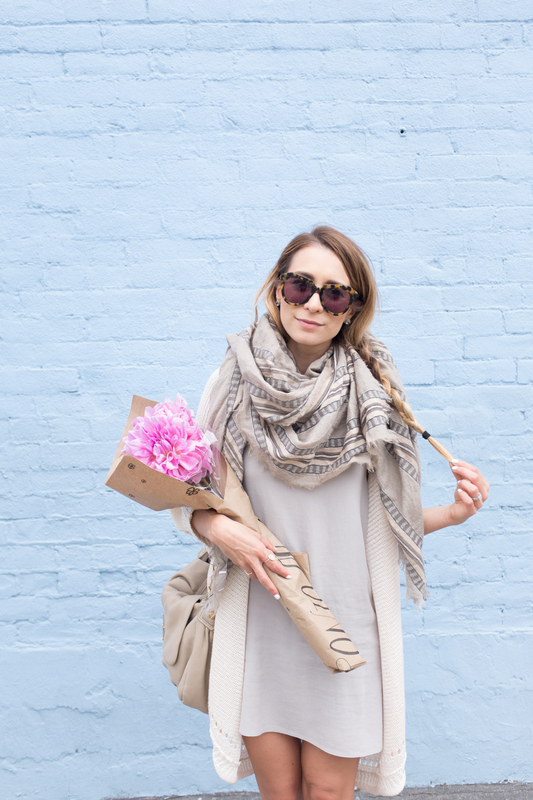 I was determined to get my coveted flowers so I dressed in my most cozy weekend wear, dragged Brian out of bed and off we went! Summer weather cam be temperamental in Toronto, so having a blanket scarf on-hand is necessary. I love how well this massive blanket scarf from Aritzia paired with the grey and neutral tones of this casual outfit, and it kept me nice and warm on a chilly day. Rain or shine, the dahlias had to be mine; besides - who needs sunshine when you have bright flowers and coloured walls. I actually wasn't going to post these photos. I thought to myself "it's just a pair of boyfriend jeans and some heels, what's so special about that?" Life isn't always maxi skirts and curled hair, sometimes it's a Thursday night after a long day of work and you're running out the door in a pair of boyfriend jeans and unwashed hair trying to make your dinner reservation on time. Thank the heavens for shoes, am I right? Just getting into the shoe game, I'm amazed how a great pair of heels can elevate even the simplest outfit. These pointy-toe stilettos from Club Monaco are a great addition to my humble-but-growing shoe collection, and really pull together a simple outfit of destroyed boyfriend jeans and a white tank. A great pair of shoes is everything - they may not be able to wash my hair for me, but they make me feel good and that's all that matters. Not to sound incredibly cliché but I can't believe that we're already in August - where has the time gone? August is an incredibly special month to me, since it's the month that Brian and I were married in and when we began our amazing honeymoon. Don't get me wrong, I appreciate the month much more now that the wedding planning is long over - you couldn't pay me enough to plan a wedding again! Nowadays August means warm summer nights, with an increasingly early sunset and getting the absolute most out of summer while it's still around. This breezy pearled grey maxi skirt is perfect for a late summer evening, and is especially fun to wear when there's a little wind. Paired with a simple white cami and strappy wedges, this skirt makes me already nostalgic for easy summer dressing - after all, we are already in August.